Kabir says to Salamat that Amir already married Alina so you cant marry her with your son. Zeenat says who married her? what are you saying? Amir comes there and says I did, all look on. Samir is angry. Kabir tells Salamat that how can you marry her now? Zeenat and Kashan lied to you for money and didnt tell about Alina’s marriage, parents didnt like Amir so we silently made her marry Amir. Amir shows them wedding card and pictures of their wedding. Zeenat is stunned to look at them. She says anyone can photoshop them, they are all lying, I dont agree, give me a solid proof if you have. All look on. Irfan comes there and says I have solid proof, I have their nikah papers, all are stunned. Priest reads it and says this is valid nikah so Alina cant marry Samir. Zeenat says they are fooling us. 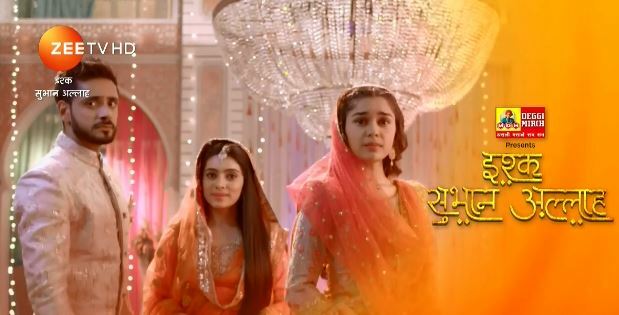 Zara asks Alina to not be scared, we are all with you, Alina says I am married to Amir so I dont accept this wedding. Kashan says she is lying. Salamat slaps him and says you cheated us? she was already married? Kashan says this Kabir is cheating. Kabir says you cant talk about cheating. Samir says this marriage will happen. He tries to attack Kabir but Amir points gun at him and says I am army’s sharp shooter so silently leave. Kabir says to Alina that take your revenge now. Alina glares at Samir and says you tried to threaten me? She keeps slapping him. Zara hugs Alina. Kabir says to Shahbaz that you want to say something to Salamat? Shahbaz asks Salamat to silently leave, he slaps him hard, Salamat glares at him. Samir tries to go to him but Kabir grabs him and says I will kill you, get lost. Salamat and Samir leaves. Ayesha says to Irfan that you got part of this plan? Irfan says Kabir gave me right reasons. Flashback shows Kabir saying to Irfan that you can save a life with one lie, my sister’s life is in your hands, flashback ends. Kabir hugs Irfan. Kabir and Zara offers prayers. Kabir gets call and says okay great. Kabir brings food and says this is for Alina’s freedom. Salma comes there and hugs everyone. Salma asks who is he? Zara says he is Alina’s husband, all laugh. Zara says he saved Alina. Alina thanks Amir. Amir says I was just doing my duty as human, I got to meet nice people. Kabir says to Irfan that how you got inside house with guards outside? Flashback shows how Irfan told guards that he was qazi for nikah, all laugh. Shahbaz says to Irfan that I know you from 25 years, I was always behind you so I had grudge against you but what you did today made me realize that relations are above any position, I am really sorry. Irfan says Alina is my daughter too, I did it for my daughter. Salamat throws water on Kashan. Kashan is tied to chair. Zeenat says they are lying. Salamat says Irfan wont lie. Irfan says to family that this is a real nikah, I didnt lie. He asks Alina and Amir to sign on papers, all are shocked. Irfan says I did fake signs but now I want their signs so if Zeenat claims in court then we have solid proof of nikah. Samir says to Zeenat that I want Alina, I want her at any cost, I want to win Shahbaz’s heart, I will tell you what I will do now. Irfan makes them sign nikah papers. Irfan says we are witnesses, now Samir cant claim anything. PRECAP- Salma says what we will do with Zeenat and Kashan? Shahbaz says we will leave from here. Kashan comes there and says we repent our mistakes so we are giving this house back to you. Kabir says its their trick.